What is Mobile Check Deposit (MCD)? MCD is a free service that allows you to deposit checks into your eligible Ideal CU deposit account(s) electronically using the camera on your iPhone, iPad, or Android device. What if I haven’t used Mobile Banking? What devices are compatible with MCD? Only iPhone, iPad and Android devices are compatible with MCD. What if I’m not able to log in to Mobile Banking? Use your Ideal CU Online Banking credentials to sign in. If you have not enrolled in Online Banking yet, enroll now to establish your credentials. Yes! MCD allows you to save time, money, and gas by safely depositing checks into your eligible deposit account(s) anytime, anywhere with your compatible smart phone or tablet. Is there a cost to use MCD? MCD is a free service provided you by Ideal CU. However, usage rates from your mobile carrier may apply when using Mobile Banking. Make sure you understand the terms of your mobile agreement before using the app. How do I access MCD? Access MCD within the Ideal CU Mobile Banking App. Have an iPhone, iPad or Android device. Download the most recent version of the Ideal CU Mobile Banking App. Have an active Ideal CU eligible deposit account. Be enrolled in Ideal CU Online Banking. List your current email address within Online Banking. Be in good standing with Ideal CU. Can Business accounts use MCD? Yes, MCD is available for eligible Ideal Business accounts. Can I use MCD to deposit funds to any Ideal CU account? You can only deposit checks into your own eligible deposit account(s); this includes savings and checking accounts. NOTE: Checks written written from one of your Ideal CU accounts to another Ideal CU account of which you are the owner will not be accepted. To transfer funds between your separate Ideal CU accounts, log in to Ideal CU Online Banking, select the "User Services" tab and click "Add New Online Account." Once you finish adding your other Ideal CU accounts you will be able to make transers via Online Banking. Can I use MCD on more than one account that I have at Ideal CU? Each eligible deposit account from your online banking profile will be included as an option to deposit funds when using MCD. Log in to Ideal CU Online Banking and select the "User Services" tab to request access to an Ideal CU deposit account. Once approved, this account will show up as an eligible account to deposit funds via MCD. How do I endorse a check submitted using MCD? 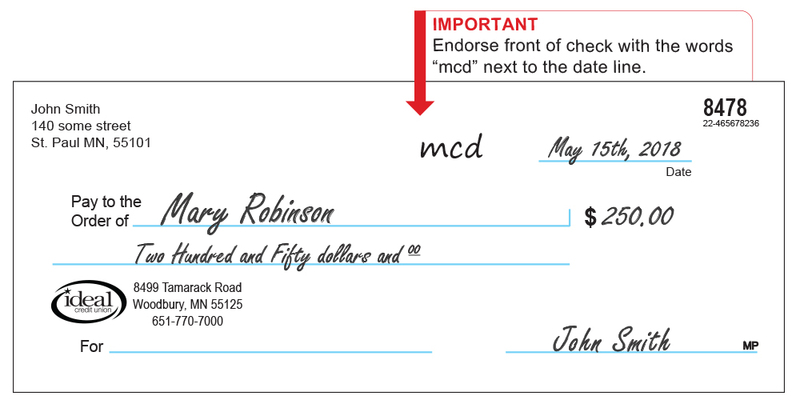 Checks must be properly endorsed by all payees, noting “MCD” on the front of the check and "For MCD Only" below the endorsement(s) on the back of the check (see example below). NOTE: Checks made payable to multiple payees! Checks made payable to multiple payees will only be accepted if all payees are joint on the eligible deposit account. If the check is payable to both you and a joint owner, either party can endorse. What types of checks does MCD accept? Acceptable check types made payable to you and/or joint owners include personal checks, business checks, or cashier's checks drawn on a financial institution located within the U.S.
What types of checks does MCD NOT accept? To take a picture of your check, place it on a flat, non-shiny surface. Make sure your environment is brightly lit and your check is not under direct sunlight. Hold the camera directly over the check and use the borders to properly zoom and scale until the check is in full view. NOTE: The picture should only include the image of the check. (Make sure other checks, books, keys, change or shiny items are not in the picture. Reflections, glare and blurring may also result in your deposit being rejected). Is there a limit on how much I can deposit? You can deposit up to $3,500 weekly into eligible Ideal CU deposit accounts. You can apply to increase your daily limits by contacting the credit union at 651-770-7000 or 800-247-0857. Yes, multiple check items can be deposited in one session as long as they do not exceed the daily deposit limit. You will receive an on-screen confirmation immediatley after submitting your check deposit. This only confirms that you have submitted a deposit and does not guarantee availability of funds in your account. All MCD deposits are subject to physical review and deposits may be adjusted or rejected based on the check’s content and accuracy. All deposits must meet our deposit criteria. Will my check deposit be available immediately for use? Deposits made before 3:30 p.m. (CST) Mon - Fri will be posted to your account by 6:00 p.m. that same day. Deposits made after 3:30 p.m. (CST) Mon- Fri will be posted to your account the next business day. Deposits made on weekends or holidays will be posted to your account the next business day. No. A check can only be deposited into MCD once. Entries with an incorrect check amount will be reviewed, adjusted and credited for the correct amount of the check. However, if you see a discrepancy in the deposit posted, please contact Ideal CU at 651-770-7000 or 800-247-0857. Why is a deposit I made still not showing in my available funds? Some checks may be subject to a hold (see our Funds Availability Policy). Incorrect endorsement (see MCD Endorsement Guidelines). Payee or payees not present on deposit account: All payees listed on your check must be an owner or joint owner of the deposit account. Check is stale/post-dated: Make sure the check you are depositing includes the date the check was issued. Your check is stale-dated and will be rejected if the date issued extends six or more months prior to the date of deposit. If this occurs you will need to request a new check be issued to you. Your check is post-dated and will be rejected if the date issued is a future date from the date of deposit. An Ideal CU representative will email you if your deposit is rejected. Please retain your deposited check for 14 days before securely disposing it. What should I do with my check after using MCD? Uploaded deposit information can be viewed the Mobile Banking app for 90 days, and all approved deposits will in Online and Mobile Banking transactions history.